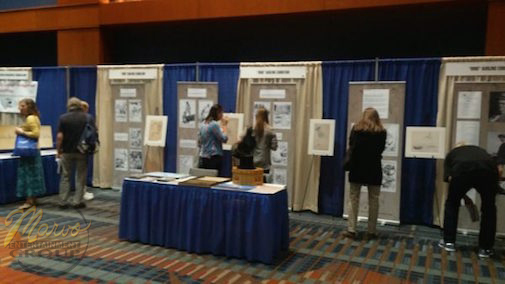 The Hidden Works of Jay N. “Ding” Darling — pioneering conservationist, creator of the Duck Stamp and two-time Pulitzer Prize winning cartoonist — was on display at this year’s Wildlife Society Conference. This rare and insightful look into some of Darling’s most personal works is curated by documentary filmmaker and nationally recognized Darling expert, Sam Koltinsky. 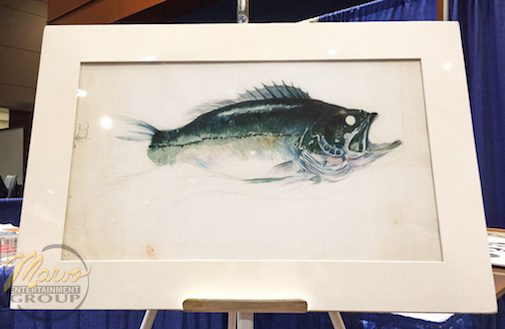 The exhibit was supported in part by Kip and Andrea Koss, Russell Cowles, Carolyn Hunter, Gloria Payne, The Wildlife Society, “Ding” Darling Wildlife Society, and the Des Moines Register. 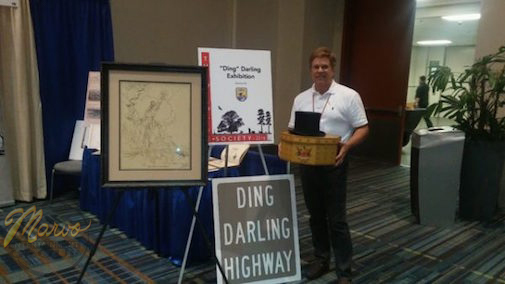 The exhibit contains a carefully selected number of Darling’s works as well as some of his personal artifacts. 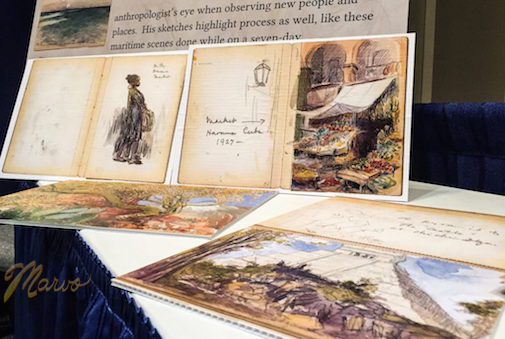 A success at The Wildlife Society conference, the exhibit is scheduled to be displayed at next year’s conference in Albuquerque, New Mexico with even more treasures! Jay N. “Ding” Darling prolifically produced images of caricatures, landscapes, and people containing incredible detail, both in black and white and bold colors. 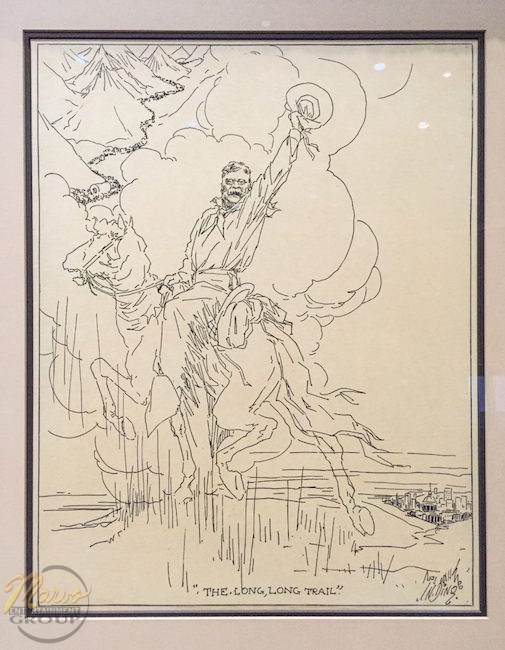 It is no wonder the Sioux City Reporter promoted Darling from a cub reporter to daily cartoonist upon discovering his incredible talent. But that is only part of his story. 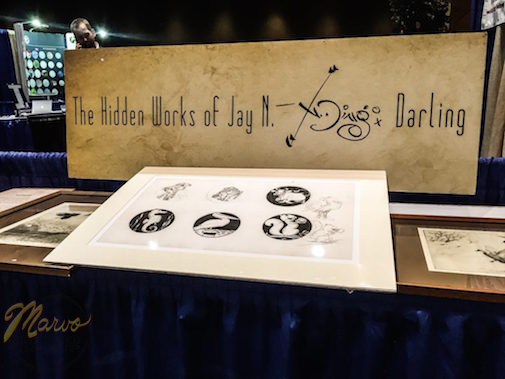 Darling’s story is an impressive one–of a talented artist and pioneering conservationist– and The Hidden Works of Jay N. “Ding” Darling exhibit is an opportunity to enjoy a palpable journey through his extraordinary life and career. This exhibit imparts the magnitude of the effects Darling’s work had on his audience. His works contain social and political images that are just as pertinent today as they were when he created them. Jay N. “Ding” Darling was a visionary and a renaissance man, and his artwork and activism continue to have a positive impact on the world. 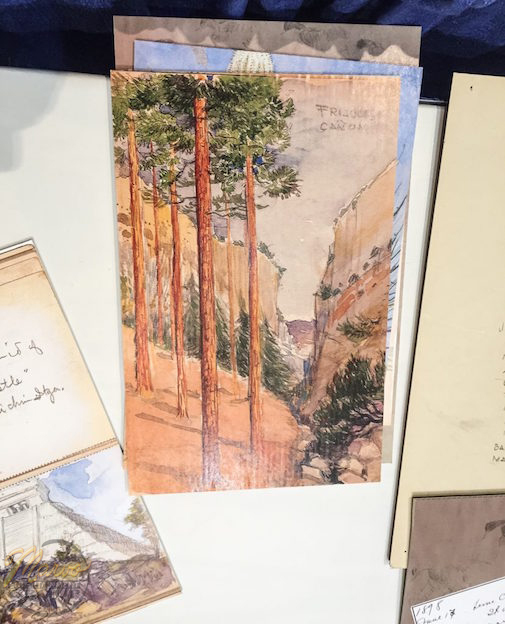 This exhibit serves to educate visitors about and re-ignite the principles that Darling believed in: conservation, collaboration, partnerships and so many others. 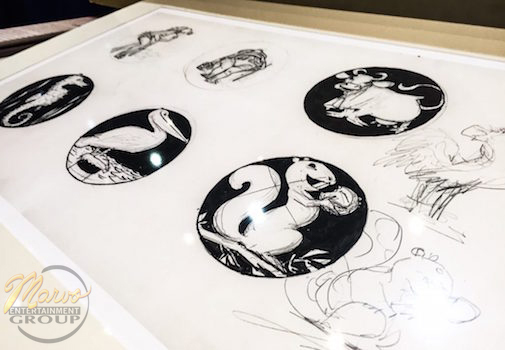 Black and white caricature drawings exhibit Darling’s love of nature AND his playful spirit. containing eye-catching colors and great detail. Another colorful piece included in the exhibit that the world has not seen. A perfectly piscine piece from Darling. Observe his attention to detail. 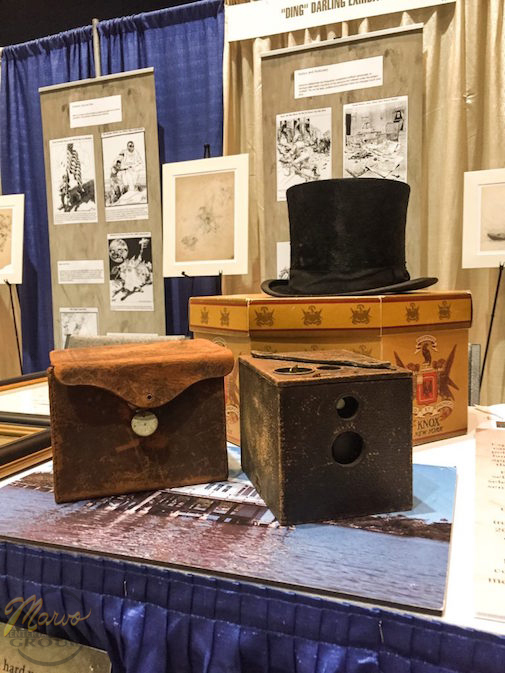 Visitors got to step back in history and view some of Darling’s personal artifacts. 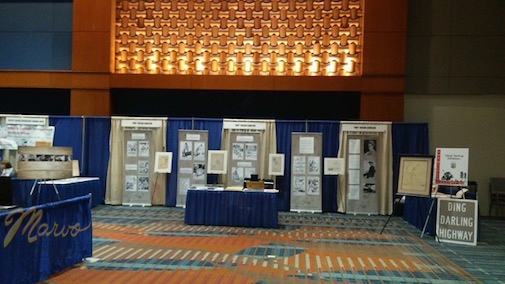 is also included in the exhibit, courtesy of Roosevelt High School in Des Moines, Iowa. Exhibit Curator, Sam Koltinsky, with Darling’s tophat. 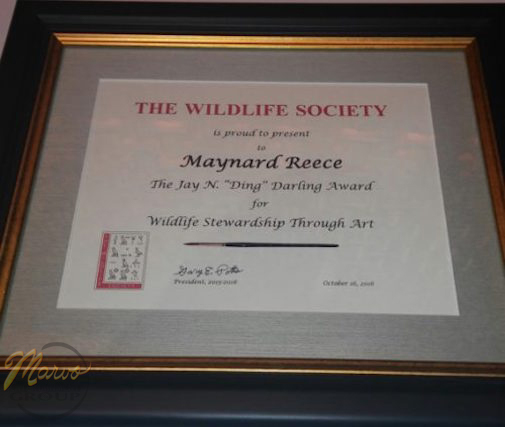 The exhibit includes the first Wildlife Society Jay N. “Ding” Darling Award–given to Iowa-based wildlife artist, Maynard Reece. 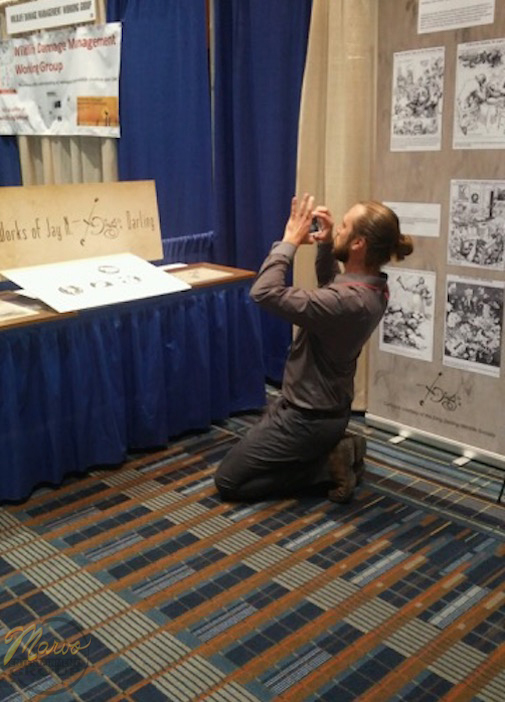 Photos of the exhibit were taken by Corey Shaw. If you are interested in hosting the exhibit at your venue, please contact Sam Koltinsky at sam@marvoentertainmentgroup.com.